The destruction also is comprehensive. One photo, or two or three, can’t fully capture the wrecking ball that was Islamic State occupation over the last two years, especially in areas where Christians historically have lived. Every street, every doorway, every wall in some way is marred or destroyed. A run of metal fencing, even, stands twisted, deformed, melted. Militants tunneled passageways running 30 feet deep beneath houses, leaving the dirt piled high inside bedrooms, where it reached above the curtains. They punched large doorways through houses so they could pass house to house undetected by U.S. reconnaissance aircraft. Piles of rubble replace furniture, and debris substitutes for artwork and signage, anything that made everyday life beautiful and meaningful. 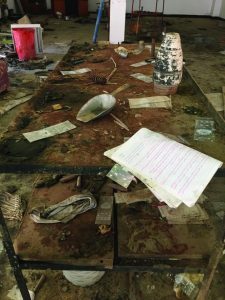 In a church cemetery in Bartella, militants uncovered and desecrated nearly every gravesite, even prying open caskets, then leaving bodies exposed but still wrapped inside. At first look the upheaval appears chaotic, as though an earthquake has struck. But on closer examination the destruction proves to be grimly systematic, the work of a sick but highly organized bureaucracy—a manquake. The Islamic State “perpetrated crimes against humanity, ethnic cleansing, and war crimes against Christian, Yezidi, Turkmen, Shabak, Sabaean-Mandaean, and Kaka’i people in [Nineveh] province between June and August 2014,” declared the U.S. Holocaust Memorial Museum in a 2015 report. What you see along the streets of Qaraqosh—and dozens of other towns—is evidence of those war crimes and more. Besides forcing those people groups from their homes en masse, looting or destroying all their possessions, killing and enslaving thousands of them, ISIS made its daily vocation over a two-year period to desecrate or reduce to rubble their residences, shops, and churches. They brought in earthmovers and bulldozers to do what chisels and explosives could not. Their goal, in short, was to eliminate for these non-Muslims their past, present, and perhaps their future. As fighting against ISIS enters a fifth grueling month in Iraq, centered just 20 miles from Qaraqosh in Mosul, the Islamic State’s brand of war crimes hasn’t ended. ISIS in recent weeks began using armed drones, dropping grenades and homemade explosives on civilian and military targets in Mosul. The jihadists, too, aren’t entirely vanquished from liberated areas. In recent weeks a jihadist emerged from the tunnel system ISIS built beneath Qaraqosh. Army members shot and killed the fighter, then discovered he was a 13-year-old boy. THE AIR WAS COLD but the sun shone bright on the recent February morning when I walked through devastated Qaraqosh. The last time I visited the city, also called Hamdaniyah, was in 2008, when a boisterous parade of Christians, mostly Assyrians and Chaldeans, filled the streets to protest an election law. A noisy crowd carried banners, local TV crews followed, men stood on corners chain-smoking, and delicious aromas rose from open-air bakeries churning out flatbread and kebab stands sizzling with lamb and beef. Afterward my driver bought a whole roasted chicken cooked with onions and peppers, and we ate it, picnic-style, in the open sunshine. This time the same streets were silent as graves. Once a city of more than 60,000 residents, a near-empty Qaraqosh was liberated last November. ISIS cut electricity and running water, and that along with the ongoing dangers—IEDs, tunneling, and stray Islamic State fighters—was still keeping residents away. Occasionally a car passed, former residents touring the damage. A soldier bicycled by, almost noiselessly. The only real sound was my own feet crunching into rubble outside St. George’s Church. St. George’s faces a roundabout in a once-busy market area. The shops across the street where soda, cigarettes, and children’s clothing had once been sold were now black holes. Metal doors had been twisted from their hinges and the walls spray-painted with black ISIS inscriptions. The acrid odor of burnt metal, oil fumes, and decomposing flesh lingered. Dead electrical lines lay across sidewalks, but glass, all blown from upper story windows, had been swept away. Unlike other churches I saw, where militants sprayed walls with oil then torched them until they charred black, St. George’s sanctuary was intact: ISIS had used it as a cache to store missiles. In a classroom building across a rubble-filled courtyard, ISIS had set up a bomb-making factory. Much of it still remained as ISIS left it, because church leaders and local officials awaited some official inquiry. After all, these were the scenes of war crimes. Sacks of open fertilizer and barrels of sugar sat on the floor alongside makeshift detonators. On a table were strewn kitchen scales, mixing bowls, and a measuring scoop, along with a coil of wire and a notebook on concocting lethal IEDs. In a corner was a pile of screws and empty shell casings used to pack suicide vests. The army caught some of the bomb-makers inside tunnels beneath the church, Bassam said. But months now of holding the city can’t erase years of violence. “There were killings and horrible things happening in the church courtyards,” said Bassam. His own family members were forced out and are living in Iraqi Kurdistan about 30 miles away. His brother, a monk at Mar Behnam Monastery about 10 miles south, barely escaped execution when ISIS took over the site, a fourth-century monastery built by Assyrian King Sencharib. ISIS blew up and destroyed parts of the site in March 2015. Such catastrophic losses haven’t dimmed Bassam’s family’s hopes of returning. “They will all be coming back for sure,” he said. 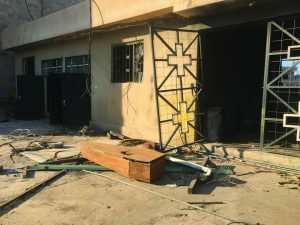 Emanuel Youkhana, an Assyrian Church of the East priest who heads Christian Aid Program Northern Iraq, said he’s no longer sure there is a future for Christians in Mosul. Besides destroying Christian landmarks and homes, ISIS eliminated public records, making legal claims over contested property difficult. When Youkhana visited Mosul in late January, he visited two damaged churches used as warehouses by ISIS. Already one of them had been turned over to a contractor, who was dismantling the building until the Iraqi army intervened. Complicating the situation are the competing armed forces currently fighting ISIS in and around Mosul. Besides the Iraqi army and the U.S.-led coalition supporting it, Kurdish peshmerga hold territory east of Mosul toward the semiautonomous Kurdistan region, separate Kurdish militias from Syria and Turkey hold territory in the west, and Iranian-backed Shiite militias fight alongside the Iraqi army in Mosul. They also control some of the territory in Nineveh, including once-Christian towns like Bartella. For Christians hoping to return, knowing who will control their hometowns and whether they can be trusted is the challenge. YODER, WHO HAS DIRECTED CAM AID PROJECTS in Iraq for a decade, is among a number of Christian workers not running from the challenges of the ISIS conflict. Remarkably, as fighting has intensified and Iraq again has become a war zone, some aid groups are pressing toward the front lines. One of the partner groups Yoder has helped supply is Free Burma Rangers (FBR), an American-led aid group with 20 years’ experience providing help to war victims—though thousands of miles from Mosul in Burma. Director David Eubank, a former U.S. Army Special Forces officer, got a call to help in Iraq and Syria in 2015, and by November 2016 he was handing out badly needed supplies to civilians caught in combat. “Over and over we’d hear this part of Mosul was clear of civilians, nobody was living there, and when the bullets stopped flying people would pop up from their houses by the hundreds. They were desperate for help,” said Eubank. Besides material help, FBR also offers spiritual teaching and neighborly kindness. Eubank’s team—which includes his wife Karen and three children—hosts “Good Neighbor Clubs” in the areas where they work. These include mornings of singing and storytelling, usually featuring Bible stories, plus games and T-shirts for school-age children. Mortar rounds and gunfire sounded from West Mosul as the FBR team led children in a round of “duck, duck, goose” in East Mosul in February. The approximately 1,000 people living in the suburb of Shahrazad, mostly Muslims and Turkmen, survived two years of ISIS control plus its fight with the Iraqi army in December. ISIS dug mortar pits in the school playground where FBR held its program, and surrounding buildings are pockmarked with bullet holes. Earthen berms surround the area. Eubank has been caught in the crossfire. His team was pinned down alongside Iraq’s 36th Brigade during several days’ fighting at Al-Salam Hospital, one of Mosul’s largest medical facilities. Soldiers advanced quickly into the area then became surrounded by ISIS fighters, who called for reinforcements from throughout the city. ISIS deployed suicide bombers, destroying half a dozen tanks and killing about 20 soldiers, before U.S. airstrikes successfully targeted the ISIS positions. THE MOST PROMINENT U.S.-led aid work at the battlefront with ISIS is the newly constructed emergency field hospital set up by North Carolina–based Samaritan’s Purse in January. The hospital sits on a heavily fortified 5-acre plot across the highway from Bartella, the devastated Christian town 10 miles east of Mosul. The 54-bed unit has two operating rooms beneath tents, plus its own blood bank and pharmacy. It sits on cleared ground behind two rings of blast walls, with both internal security and a cordon of protection provided by the Iraqi army.The facility treats only trauma victims, who include civilian casualties from bombings and combat, Iraqi military personnel, and those treated as enemy combatants, such as ISIS fighters. Nearly all arrive from Mosul, where bombed-out bridges and medical facilities make on-site trauma care impossible. In its first month of operation, medical personnel at the field hospital performed more than 260 surgeries. On the day I visited, the women and children’s ward had 11 patients in recovery, including a 10-month-old girl who had lost both feet in an IED explosion. A boy of about 10 years old was exiting surgery, having had a rod inserted in his leg following shrapnel injuries. To keep pace with the steady stream of urgent care, the hospital has a steady rotation of mostly American trauma veterans. And each day begins with group devotions. Edwin Carns, hospital director, likes to say he’s “not a surgeon,” but the 77-year-old emergency physician spent most of his career in the U.S. Army and earned a Distinguished Service Medal in Vietnam. More recently he’s managed crisis care in Haiti and in Liberia during the Ebola outbreak. Trauma surgeon Warren Cooper has worked in Sudan and now is based in the Democratic Republic of Congo. “I’m always in a place that’s in chronic disaster,” he said. For many of the professionals here, it’s their first exposure to mass casualties that include many children. Cooper said “a lot of emotion comes” with trying to treat whole families of wounded. 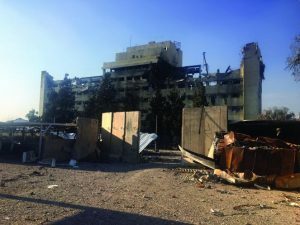 The presence of a clean, up-to-date hospital in so littered a scene of destruction suggests at least the possibility of restoration and a future for war-ravaged Iraqis.